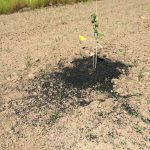 Two one-acre hazelnut plots have been established at NWREC to evaluate the effect of different irrigation rates and application methods on young, newly planted hazelnut trees. This work is supported by the Oregon Hazelnut Commission. One plot has a drip irrigation system and the other has full coverage microsprinklers. The purpose of this project is to provide irrigation guidelines to growers so that water is used efficiently and has maximum benefit for the crop. 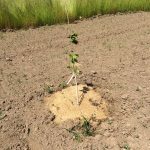 This work will examine the best combination of mulch and irrigation to optimize hazelnut tree growth and yield while minimizing water waste. Our mulches include sawdust, yard compost, mint compost and biochar. Preliminary data indicate that sawdust mulch made trees less vigorous. Berms are beneficial for tree growth in poorly drained, wet soils. They raise the roots and surrounding soil above ground level. Crops, such as blueberries, are regularly grown on berms. 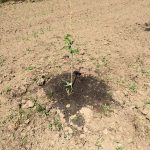 We will be evaluating the effects of berms on hazelnut tree growth. © 2019 Wiman Lab, all rights reserved.